This week we arrive in South America, where we meet up again with archaeologist Antonio Pecci who shows us Acllahuasi, where Incan priestesses once lived. I am Antonio Pecci and I am from Ferrandina (Basilicata, Italy). I have a degree in Archaeology at the Unibas (Università degli studi della Basilicata). Now, I am a collaborator at the IBAM CNR (Istituto per i Beni Archeologici e Monumentali – Consiglio Nazionale delle Ricerche) of Tito Scalo (Potenza, Italy) and I am a student of the School of Specialization in Archaeological Heritage of Salento. I got started in 3d scanning about one year and a half ago for professional work. I am an archeologist and a member of various research groups, specifically I deal with the drones and 3d model. For my works I use a Phantom Vision 2 plus and Agisoft Photoscan. The Acllahuasi (Located at Pachacamac, Geographic Coordinate -12.257034, -76.905197) is a term that comes from the Quechua language and means house (Huasi) of the chosen (aclla), is a classic Inca structure, with typical trapezoidal windows and granite foundations. It was the place where the Virgins of the Sun, priestesses dedicated to the worship of the sun, lived. The area also includes vast fields, surrounded by outer walls that separated them from the desert. Acquisition data of Acllahuasi are part of the CNR project “ITACA” led by professor Nicola Masini. 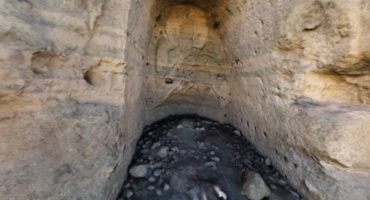 The scanning of the 3d model of Acllahuasi was performed for the scan of the archaeological excavation, to investigate the walls and create a map of the degradation. The main difficulty was to guide the drone to 360 ° around the object, avoiding trees, houses, electrical lines, etc. The results of the acquisition work, processing and interpretation of the data is still in progress and will be subject to forthcoming scientific publications. To see more of Antonio’s models here on Sketchfab, check out his profile!